The bishop speaks, writes and broadcasts on a range of issues from the environment to ethics in business, from regeneration to regionalization and from faith to its impact on the future. He is a Fellow of the Institute of Chartered Foresters (having chaired the Independent Panel on Forestry) and a Fellow of WWF, the Society of the Environment and the Chartered Institute of Water and Environmental Management. He is a Vice-President of the Town and Country Planning Association. He is a Patron of the UK Environmental Law Assocition (UKELA) and Patron of the Densholme Care Farm in East Yorkshire. The Right Reverend James Stuart Jones KBE was born in 1948. He was the second of five children of a Scottish Mother and Welsh Father, Major J Stuart A and Helen Jones. He was educated at the Duke of York’s Royal Military School, Dover where he became Chief School Prefect (Head Boy). After reading Theology at the University of Exeter and gaining a PGCE from Keele University (Alsager) he taught at Sevenoaks School before joining Scripture Union where he became Executive Producer of the Sound and Vision Unit. In 1981 he trained for the Church of England ministry at Wycliffe Hall, Oxford and was appointed as Curate to Christ Church Clifton, Bristol where he later became Associate Vicar. From 1990 to 1994 he was Vicar of Emmanuel Church in South Croydon. 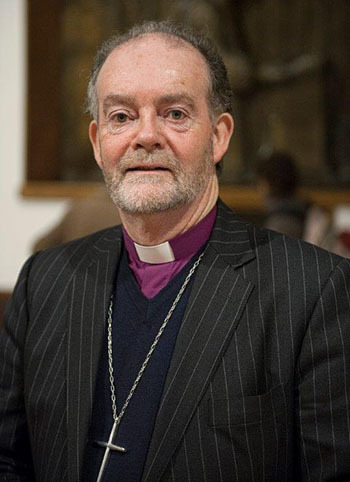 Aged 46 he was appointed to be Bishop of Hull (1994 - 1998), becoming Bishop of Liverpool four years later (1998 - 2013). He is married to Sarah (Nee Marrow) and they have three adult daughters Harriet, Jemima and Tabitha. In Hull and Liverpool Bishop James was involved in the regeneration of the cities, in particular chairing the Kensington New Deal for Communities in Liverpool. Working with the people of Kensington they opened the St Francis of Assisi City Academy which took the environment as its specialism. The diocese together with the Catholic Diocese of Liverpool sponsored three City Academies. Together with the Catholic Archbishop of Liverpool Bishop James was Co- President of Liverpool Hope University, the only joint Anglican and Catholic University in Europe. The Liverpool Echo invited him to Chair their Stop the Rot Forum which campaigned to regenerate derelict buildings in the City in time for the City becoming European Capital of Culture in 2008. The Forum saw buildings saved from demolition, most notably the Florence Institute (the Florrie), a listed Victorian Boys Club in Liverpool 8, now a spectacular community facility. In 1999 Bishop James was asked to Chair the North West Constitutional Convention. The Convention published a report, New Way Forward - No Way Back, outlining the case for regional government in the North West. For the wider Church he returned to Wycliffe Hall as Chair of Council, Chaired the Board of Mission and also the Transparency and Accountability Group for the Church of England. He was Bishop to Prisons (2006 - 2013). He was a member of the House of Lords from 2003 - 2013 speaking on criminal and restorative justice issues, the environment and urban regeneration. He served on the House of Lords Communications Committee. In 2009 the Bishop was appointed by the Home Secretary to chair the Hillsborough Independent Panel examining all the documentation concerning the death of 96 Liverpool football fans at the 1989 FA Cup Semifinal. The Panel reported in September 2012 and this led to the quashing of the original inquests. He continues to serve as Adviser to the Home Secretary on Hillsborough as new investigations proceed, chairing a Forum that brings together the Families of the 96 with the Independent Police Complaints Commission, the Crown Prosecution Service and Operation Resolve. This enables them to be informed of the investigations into the deaths of their loved ones. He has a particular interest in environmental issues. He founded Faiths4Change which brings together people of all faiths working on environmental projects. Bishop James presented the award winning Radio 4 series ‘the Bishop and the Prisoner (2012) and also ‘The Bishop and the Banker’ (2013). He continues to contribute to Radio 4’s Thought for the Day. He presented the Good Friday Meditation on BBC Radio 4 2019. He has received honorary degrees from 8 Universities including Liverpool, Exeter, Gloucester, Liverpool John Moores, Liverpool Hope, Hull, Humberside and York St John. On 19th January 2017 he was made Freeman of the City of Liverpool. In the New Year's Honours List 2017 the Prime Minister recommended to the Queen that he be appointed a Knight Commander of the Order of the British Empire 'For services to the bereaved and to justice'. "The Right Reverend James Jones, lately Bishop of Liverpool, as Chair of the Hillsborough Independent Panel led what is widely recognised as the most successful inquiry of its type in recent times. His Report led to the quashing of the original inquests, fresh criminal investigations, and the largest ever investigation into the police. He developed a ground-breaking new forum for engaging bereaved famlies, making them part of the criminal investigations process while not prejudicing outcomes. He is also Chair of the Gosport Independent Panel investigating Gosport War Memorial Hospital, led the Expert Panel on the future of Forests in England, and served as Bishop for Prisons." On 1st November 2017 the Bishop presented his Report on lessons to be learnt from the Families affected by the Hillsborough Disaster . It was then laid before Parliament. Titled 'The Patronising Disposition of Unaccountable Power' the Report records the Families' experiences over 28 years and presents 25 points of learning including a 'Charter for Families Bereaved through Public Tragedy', Proper Participation for Bereaved Families at Contested Inquests and A Duty of Candour to be extended beyond the National Health Service and to include the Police. On 20th June 2018 he presented the Report on the Gosport War Memorial Hospital. In April 2019 He was elected and apponted a Trustee of the Athenaeum Club, Pall Mall, London.